Cerebral palsy is a group of disorders that affect a person’s movement, balance, and posture. Like all neurological disorders, the signs and symptoms of CP are the result of injury to specific areas of the brain affecting motor function, including the basal ganglia (deep central motor areas of the brain), long white matter tracts, particularly those surrounding the ventricles (fluid system of the brain) and basal ganglia, and the motor cortex (the outer part of the brain that initiates movement). It is caused by a variety of injuries to the brain that can occur during pregnancy, at birth, or in early childhood. Most commonly, the injury occurs at the time of birth, or as a result of spontaneous bleeding in the white matter of the brain in premature babies. The injury of Cerebral Palsy manifests as problems with tone (muscle stiffness or floppiness), uncontrollable movement (dyskinesia), and poor balance and coordination (ataxia). There are four main types of CP: spastic (affects 80% of patients and is characterized by increased muscle tone, stiffness, tightness of two or more limbs: one side, the legs, or all four arms and legs), dyskinetic (manifest by problems controlling movement. Writhing, rapid, or jerky movements and varying tone are common), Ataxic (problems with balance and coordination), Mixed (a combination of the other 3 types). Some also consider hypotonia a type of CP where the child has very low body tone, is floppy, weak, and cannot support his/her weight. In addition to motor problems, CP children can also have other problems that are the result of the injury process affecting wider areas of the brain. These include problems with cognition, vision, hearing, emotion, behavior, and autonomic function (constipation, poor circulation). Children with Cerebral Palsy experience a generalized improvement in their neurological deficits. In Dr. Harch’s experience, the seven most common dysfunctions which improve in CP children under his care are: 1) Alertness and awareness, 2) Gross motor function (movement of arms and legs), 3) Fine motor function (use of hands and fingers), 4) Tone (high tone comes down and low tone increases), 5) Cognition and speech, 6) Oral motor function (chewing, swallowing, drooling, secretion handling), 7) Balance (sitting or standing, depending on stage of development at time of HBOT). Our average CP patient sees improvement in 4 of these 7 dysfunctions. In addition, patients with cortical impairment of vision or hearing, and those with autonomic dysfunction will often see improvement. These improvements have been documented in published studies. Michael was an eight year old boy who was born premature and developed spontaneous bleeding in the white matter of both sides of his brain, more severe on the left side. This was manifest during his infancy with irritability, stiffness on the right side of his body, and delayed milestones. By eight years old he had cognitive deficits with attention/concentration and learning difficulties, constipation, uncontrollable behavior, and incontinence (no toilet training). 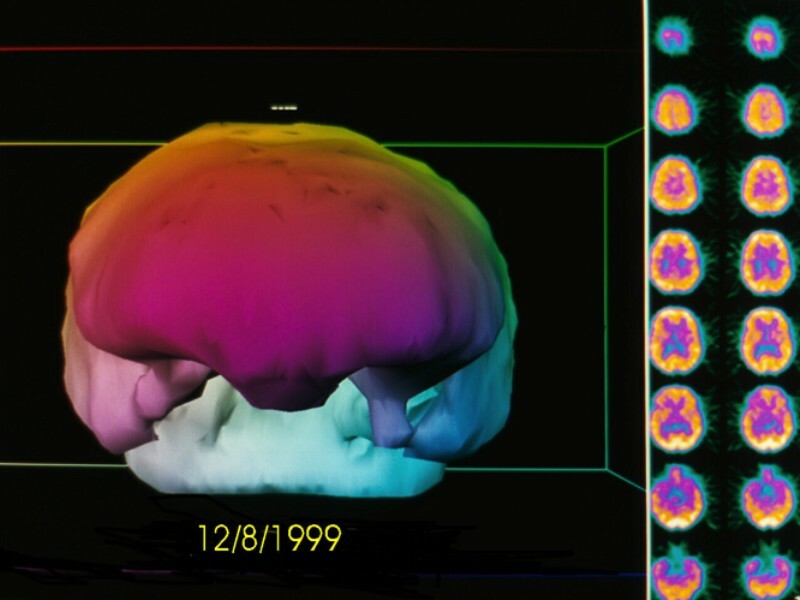 Michael’s SPECT brain blood flow scans before and after his first HBOT in 1999 are shown below. He was given two blocks of 40 HBOTs separated by a one month break. During the first block of HBOT Michael showed improvement in many of his problems for the first time in his life. At the end of 80 HBOTs he had improved use of his right leg, less stiffness in the right side of his body, a marked decrease in his constipation, cessation of incontinence (toilet training), improvement in his cognitive deficits/attention/concentration and learning difficulties, and improvement in his behavior. His repeat SPECT brain scan is shown after these 80 HBOTs. Michael’s SPECT scan before HBOT: these are sagittal pictures (taken from the side view) through the middle two-thirds of the brain. 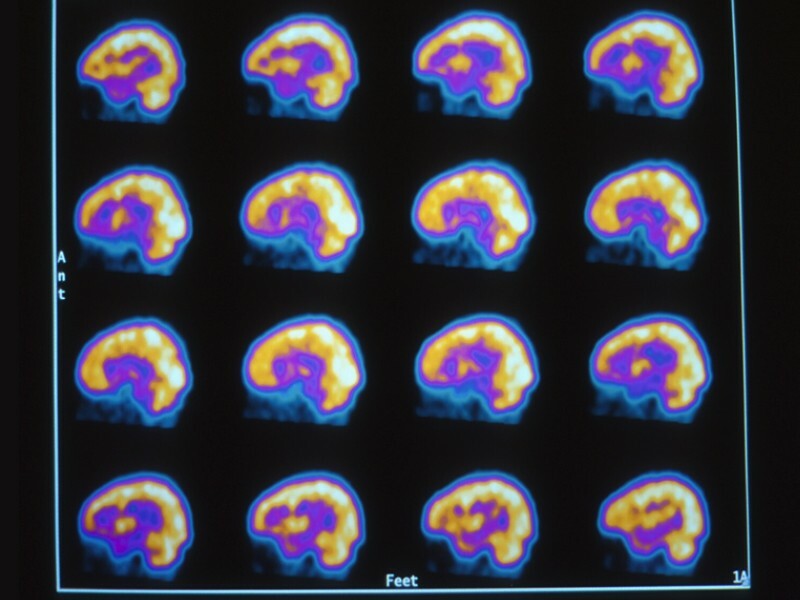 The areas of purple are significantly reduced brain blood flow. 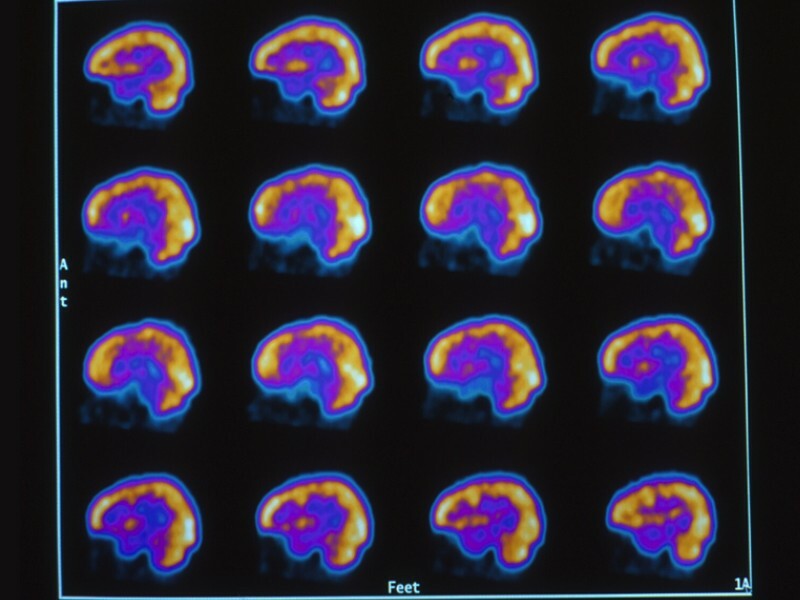 The highest brain blood flow is white, and proceeds to lower levels of yellow, orange, purple, blue, and black (black means no blood flow, dead brain tissue). 3D surface reconstruction of Michael’s SPECT scan before HBOT. 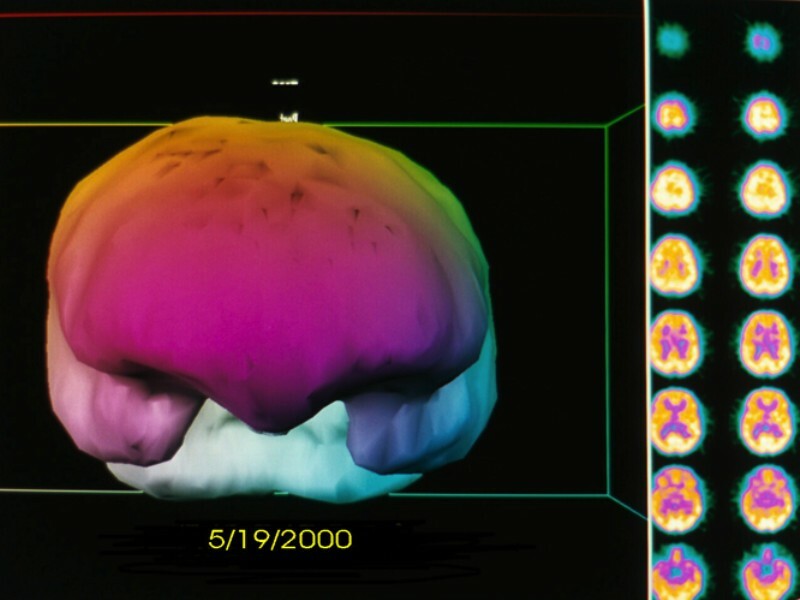 While the sagittal slices above show a diffuse injury to the brain, the 3-D surface image mainly shows injury to the temporal lobes and the lower part of the frontal lobes. Michael’s SPECT scan after one HBOT: note the generalized relative increase in blood flow with a filling in of the purple areas with more blood flow (yellow, orange). Note: A SPECT scan is often performed before HBOT and again after one HBOT to display recoverable brain tissue. In order for the increased blood flow to be more permanent, at least approximately 40 treatments are then completed. 3D surface reconstruction of Michael’s SPECT scan after 1 HBOT: while there has been a generalized improvement in blood flow on the sagittal slices, the 3-D image mainly captures improvement in the frontal and temporal lobes. Note: A SPECT scan is often performed before HBOT and again after one HBOT to display recoverable brain tissue. In order for the increased blood flow to be more permanent, at least approximately 40 treatments are then completed. 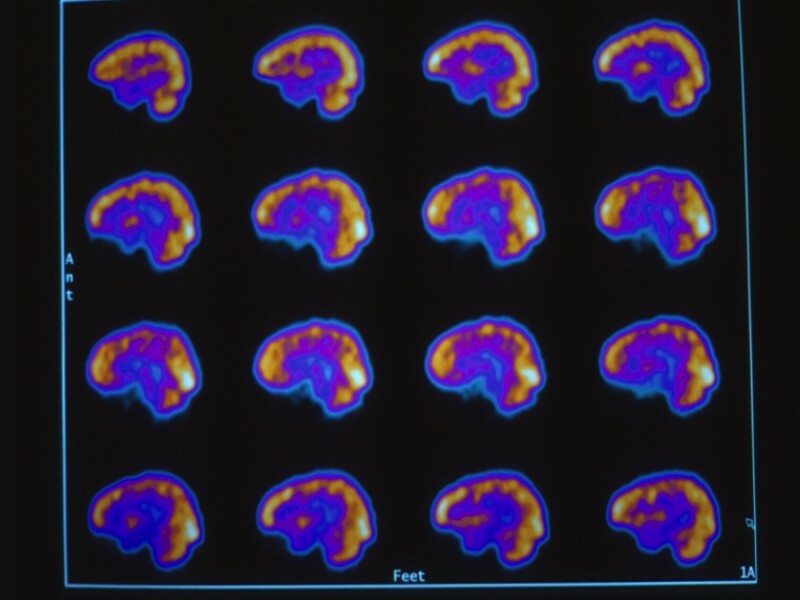 Michael’s SPECT scan after 80 HBOTs: A generalized relative increase in brain blood flow (much more white, yellow, and orange) that is accompanied by an improvement in nearly all of Michael’s motor, intellectual, and developmental problems. 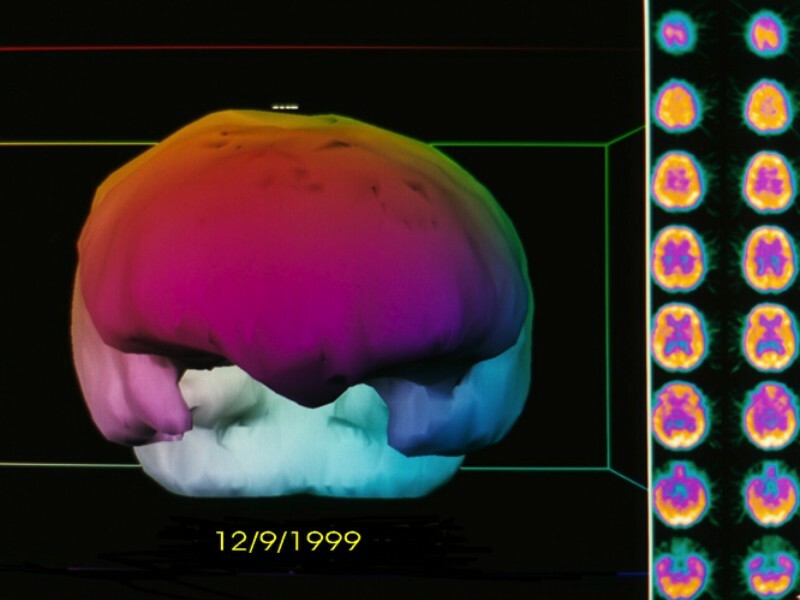 3D surface reconstruction of Michael’s SPECT scan after 80 HBOTs: Note the improvement in the frontal and temporal lobes, as well as the back of the brain, which is consistent with Michael’s overall clinical improvement. https://www.ncbi.nlm.nih.gov/pubmed/11558483. (Famous Collet study where children were given two different doses of hyperbaric therapy, one of which was compressed air. Both groups achieved substantial clinical improvement in nearly all measured dysfunction that was greater, faster, and a greater number of domains than standard therapies for CP. https://www.ncbi.nlm.nih.gov/pubmed/24851544. (Dr. Mukherjee’s study comparing HBOT to compressed air or multimodality therapy). http://www.jpands.org/jpands1204.htm (Review article page 109-in pdf format for free download. Compares HBOT to all other published therapies for CP that used the Gross Motor Functional Measures test as an outcome. The GMFM is the gold standard for motor testing in CP).